Return to Baker Street, where the world’s most famous detective encounters six new cases that require his expert touch. London’s super sleuth, Sherlock Holmes, sets out with long suffering Watson as the detectives of Scotland Yard are stumped yet again. Blood coats the street of Victorian England, but no evidence is clear and no suspect cleared of guilt. As to be expected, evil genius—the Napoleon of Crime—Professor Moriarty soon reappears. 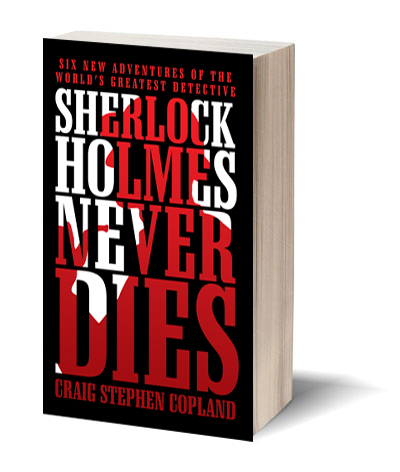 The great detective must thwart his diabolical machinations, but even Holmes is practically brought to his knees by shocking new discoveries only he can understand. Despite Moriarty’s conniving, Sherlock will use the science of deduction to unravel mysteries of theft, abduction, political intrigue, and murder. Female characters take much deserved center stage in these updated stories, no longer willing to play the part of hapless victim or jealous wife. Meanwhile, Holmes and Watson traipse the globe in search of justice. No guilty party is safe, no matter the distance, from the all-knowing eye of the world’s best detective and his daring sidekick.